I got out of my little week-long reading slump yesterday, yay! Good thing too, because my surgeon told me yesterday I'm stuck at home for ANOTHER 2 weeks. Sigh. I didn't feel ready to go back anyway so I'm glad she didn't release me (I'm a server so my job is pretty physical and I don't want to overexert myself too soon), but at the same time it's SOO BORING laying around the house all day (can't drive or get out really -- too many painkillers!). I'm slowly weaning myself off the painkillers so I'm a little more clear-headed which makes reading easier, but it still makes me super sleepy at the same time. Oh well. 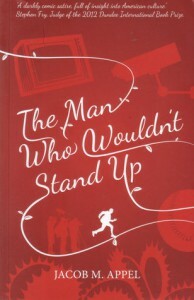 I'm about halfway through The Man Who Wouldn't Stand Up by Jacob M. Appel and I'm liking it so far. I got this as a free e-book through this site and honestly I didn't have super high hopes. But this book is actually laugh-out-loud funny, if you have a very politically incorrect sense of humor like I do. P.S. I've definitely decided that I'm never doing another reading challenge or read-a-thon again. Can't handle the pressure!